All content included on this site, such as text, graphics, logos, button icons, images, audio clips and software, is the property of Advertyze.com or its content suppliers and protected by U.S. and international copyright laws. No part of this website may be reproduced or transmitted in any form or by any means without written permission from the authors. 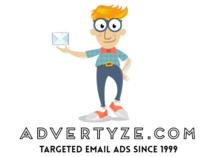 Advertyze.com is a trademark in the United States and other countries. Advertyze.com’s trademarks may not be used in conjunction with other companies’ products or services, in any manner that may cause confusion among customers and potential customers, or in any manner that discredits Advertyze.com, or its owner, its products and services. Advertyze.COM DOES NOT WARRANT THAT THE WEBSITE AND SERVICE WILL BE ERROR FREE OR UNINTERRUPTED. THE WEBSITE AND SERVICE IS DISTRIBUTED ON “AS IS” BASIS WITHOUT WARRANTIES OF ANY KIND, EITHER EXPRESSED OR IMPLIED. Advertyze.COM OR THE OWNER OF Advertyze.COM WILL NOT BE RESPONSIBLE FOR ANY LOSSES, DAMAGES OR COSTS THAT YOU AND/OR YOUR BUSINESS MAY SUFFER WHEN USING THE WEBSITE OR SERVICE. YOU AGREE TO INDEMNIFY AND HOLD HARMLESS PROFIT STUDIO FROM ANY CLAIMS RESULTING FROM YOUR USE OF THE WEBSITE OR SERVICE. YOU EXPRESSLY AGREE THAT USE OF THE WEBSITE OR SERVICE IS AT YOUR SOLE RISK. NEITHER Advertyze.COM, THE OWNER OF Advertyze.COM, NOR ITS SERVICE PROVIDERS, AGENTS, LICENSORS, EMPLOYEES SHALL HAVE ANY LIABILITY FOR ANY DAMAGES SUFFERED BY YOU OR ANY OTHER PARTY AS A RESULT OF THE USE OR MISUSE OF THE SERVICE.